It was a very rainy but successful Jane’s Walk at Jericho Beach on May 7, 2011, exploring the site of Vancouver’s 1976 Habitat Forum and remaining signs of the old Flying Boat military base. These urban walks are in honour of the renowned urbanist Jane Jacobs, and I was honoured that Jane’s son Ned, also an urbanist, attended. After the walk Ned gave an impromptu and fascinating encapsulation of Jane’s philosophy and legacy. Most of these photographs are by Andy Yan of Bing Thom Architects, who also kindly attended and took photos. Thanks go to both Ned and Andy. The flag above shows the UN Habitat logo. Since UN Habitat, still a key UN department, was launched at the 1976 conference in Vancouver, this logo had its birthplace here. 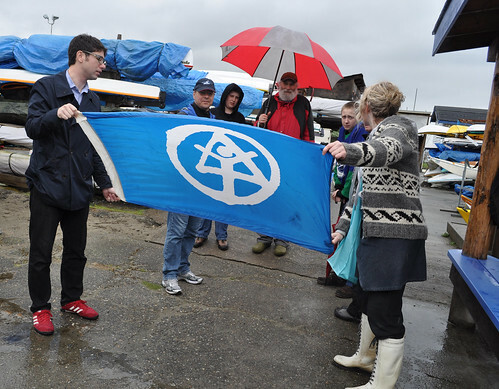 This flag flew during Habitat (May 31-June 11, 1976) above the building that functioned then as the Press Centre and now houses the Jericho Sailing Club. It was loaned to us for the walk by the Sailing Club director Mike Cotter, who’d only acquired it a few weeks before. Since so many of the refurbished hangars that housed Habitat Forum were torn down in 1979, our walk was something of an archeological dig. I did outline the location of the old hangars in powdered dolomite lime just so that our walkers could get a sense of their position and scale. I’ll be adding more maps of this later. Thanks to everyone who came! Above, Ned Jacobs at the Habitat/Jericho Jane’s Walk, talking about the work of his mother Jane Jacobs. Below, CBC screen grab showing the painting of the Bill Reid mural which transformed one of the hangars, now demolished, into a beautiful longhouse.